Quantity of tickets shown in drop down menu reflects total tickets remaining. Ticket sales are currently not available for this venue. Reserve the best seats in the house and skip the line. Presenting at 5 and 6 PM, The Preservation Legacy Band with Wendell Brunious. Presenting at 8, 9, and 10 PM, The Preservation All Stars with Will Smith. 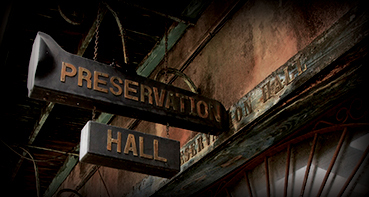 Every night, Preservation Hall presents intimate, acoustic concerts featuring ensembles made up from a current collective of 100+ local master Traditional New Orleans Jazz practitioners. These master musicians have learned the traditional style from the greats that played before them at Preservation Hall. The Preservation All Stars feature some of those master veteran musicians. With a line-up changing week to week, the Preservation All Stars provide an ever-evolving take on the New Orleans Jazz tradition. Born on October 27, 1954, Brunious was born into a Louisiana Creole family, the son of Nazimova "Chinee" Santiago and John "Picket" Brunious, Sr., a trumpeter who studied at Juilliard and played with the Onward Brass Band, Young Tuxedo Brass Band, and Paul Barbarin, and who arranged for Billy Eckstine and Cab Calloway. Brunious' brother John Brunious, Jr. was another notable New Orleans jazz trumpeter and a predecessor as bandleader of Preservation Hall Jazz Band. His nephew is Mark Braud, a successor as bandleader of Preservation Hall Jazz Band. Brunious sang in Chief John and the Mahogany Hall Stompers in the 1960s, a group in which his father was also a member. He began on trumpet at age 11 and played at Paul Barbarin's funeral. He studied at Southern University (where he played with Danny Barker) and played dance music in clubs on Bourbon Street in the middle of the 1970s. In 1976, Brunious substituted for his father in Albert "Papa" French's band for Mardi Gras, and by 1979 was playing regularly at Preservation Hall with Kid Thomas Valentine. He was named leader of the group upon Valentine's death in 1987. He has also played with the Eureka Brass Band, Lionel Hampton, Linda Hopkins, and Sammy Rimington. He played with Louis Nelson in 1986-89, and did recordings with the Caledonia Jazz Band of Norway. His first record as a leader came in 1986, which featured Nelson, Rimington, and Barry Martyn as sidemen. He later played with Dr. Michael White, Chris Barber, Papa Don Vappie, Bob Wilber and the Pfister Sisters. He remains a regular performer at Preservation Hall today. Will Smith grew up in Preservation Hall, where his sister Dodie Smith-Simmons worked and his brother-in-law trumpeter John “Kid” Simmons sometimes played. Smith used to help push Sweet Emma’s wheelchair to the car when her son came to pick her up, and most of the time she said something mean. “She was a real cantankerous old broad, but she was a great entertainer who captivated the audience,” Smith recalled. After following around his brother-in-law, Smith could not wait to get an instrument of his own. His parents eventually bought him a trumpet, and he has been playing New Orleans jazz ever since. Hall legends Percy Humphrey, Ernie Cagnolatti, Kid Thomas, and DeDe Pierce remain a part of Smith’s musical fiber and have greatly influenced his sound. In 1975 Smith joined the Fairview Baptist Church Band, led by legendary jazzman Danny Barker, and he has played and toured with numerous traditional brass bands, including the Storyville Stompers and Harold Dejan’s Olympia Brass Band, as well as the Doc Paulin, Chosen Few, Treme, Tornado, Lil’ Rascals, and Pinstripe brass bands.